In a show of American ingenuity, Mike Wilkins used a collection of vanity license plates to phonetically spell out the preamble to the US Constitution in abbreviated script. The artist requested each of the plates from all fifty states and the District of Columbia, represented in alphabetical order, to mark the Constitution’s bicentennial. Though the plates rarely make sense on their own, together they re-create one of the greatest documents in American history. 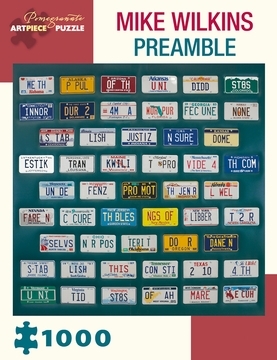 This work represents the meaning of the phrase “the United States” with a fun twist.